You are going to Watch One Piece Episode 439 English dubbed online free episodes with HQ / high quality. Stream Anime One Piece Episode 439 Online English dub Luffy’s Treatment Begins! Ivan-san’s Miraculous Power! Emporio Ivankov displays some of his powers, including stopping a vengeful pirate’s cannon shot merely by winking and then turning him into a woman. 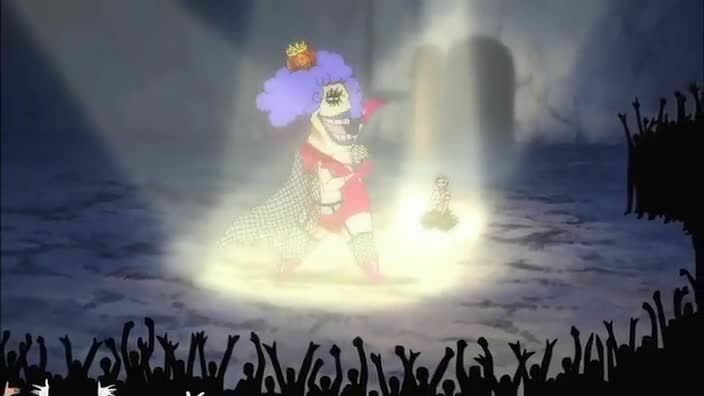 Ivankov tells Bon Clay that he saved him because Luffy begged him to, and he is healing Luffy with his hormone-based powers, which only work on those with extraordinary will to live. Unfortunately, the treatment takes 10 years off of Luffy’s lifespan, leaves him in agonizing pain, and will last over two days, with Ace’s execution coming in only 16 hours.